This superb cake full of flavors will impress your guests! With its touch of Baileys, whipped cream and creamy chocolate, no one can resist! 1. Grease a 9x13 inch rectangular cake pan. Set aside. Preheat the oven to 300 ° F while preparing the recipe. 2. Add all the dry ingredients for the cake in a bowl and mix. 3. Add eggs, milk, vegetable oil, 1/2 cup Baileys and vanilla and mix until ingredients are well combined. 4. Slowly pour boiling water over the mixture, and mix well. 5. Transfer the mixture into the cake pan and bake for about 40 to 45 minutes, or until a toothpick comes out with a few crumbs, but nothing liquid. 6. Remove the cake from the oven and, using the handle of a wooden spoon, poke holes all over the top. 7. While the cake is still warm, add the chocolate chips to a medium sized bowl. Set aside. 8. In a microwaveable measuring cup, combine the condensed milk and the 1/2 cup Baileys. Heat until the liquid begins to boil, then pour over the chocolate chips. 9. Whisk until smooth, then immediately pour over the cake, spreading it into the holes. 10. Put the cake in the refrigerator to cool. 11. When the cake has cooled, add the ingredients for the whipped cream topping to a large mixer bowl. Whip on high speed until stiff peaks form. 12. Spread the whipped cream on the cake. Sprinkle mini chocolate chips and chocolate sauce, if desired. Refrigerate until ready to serve. Slice the cake and enjoy ! 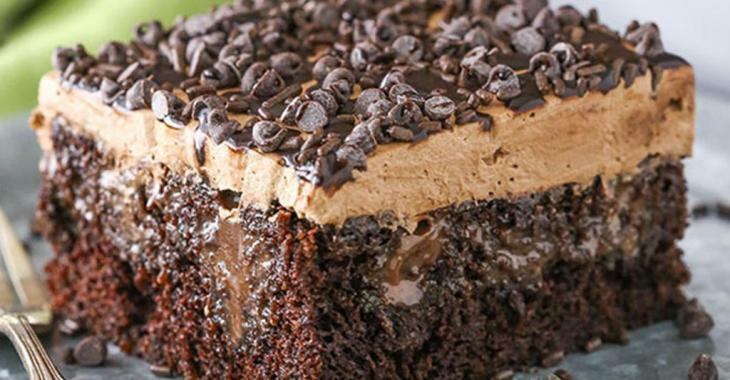 Note: This Baileys chocolate cake recipe gives about 12 to 15 servings.